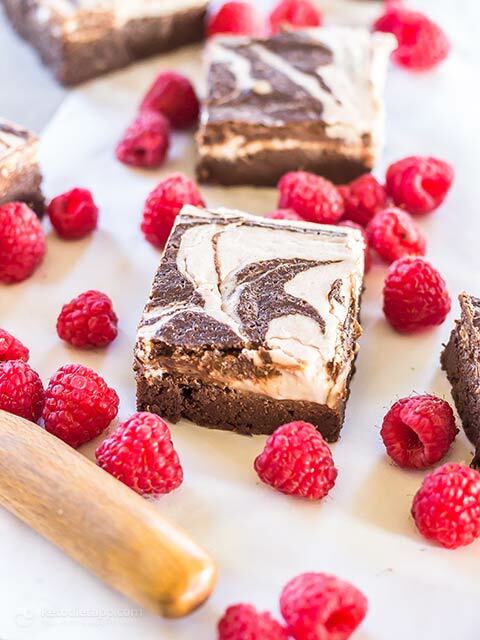 These keto raspberry cheesecake brownies are the PERFECT low-carb dessert for Valentine’s Day! 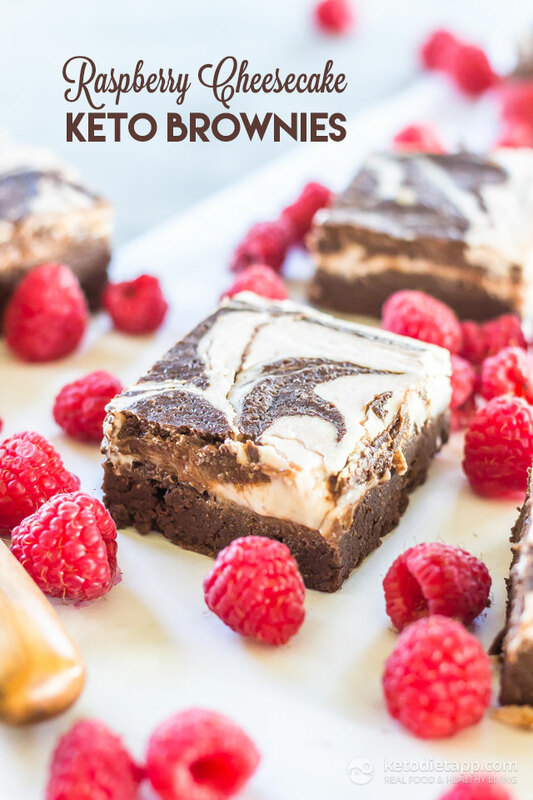 I just love the swirled tops and the fudgy keto brownie paired with the tart raspberry cheesecake is a match made in heaven. 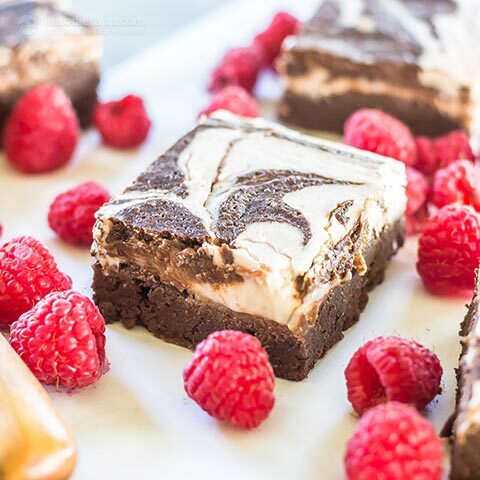 These brownies are RICH, so if you’d like to cut them into 18 servings instead of 9 you’d probably be just fine. This would also work well if you’re taking these to a party! 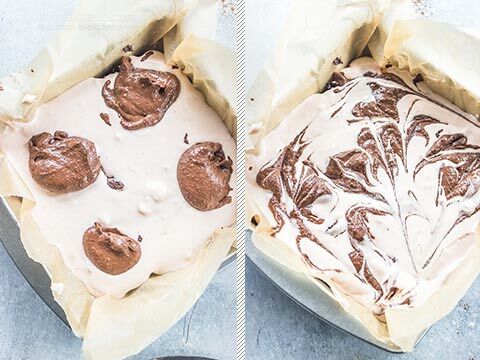 Preheat the oven to 175 °C/ 350 °F (fan assisted) and line an 20 x 20 cm (8 x 8 inch) brownie pan with parchment. 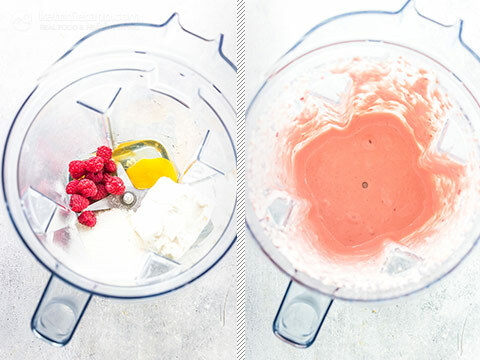 For the cheesecake layer combine all of the ingredients in a blender and blend until smooth. 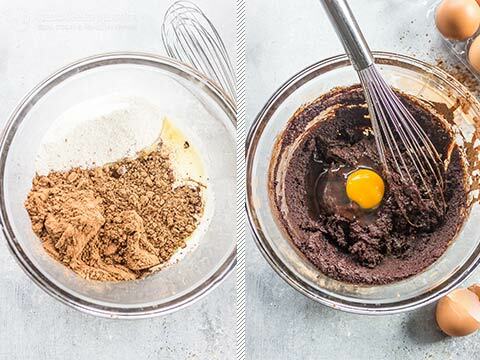 For the brownie layer combine all of the dry ingredients in a medium bowl and mix until well combined. Add in the eggs, melted butter and vanilla extract and mix until smooth. Transfer all but 1/2 cup of the brownie batter to the pan then top with the cheesecake layer. Mix the remaining brownie batter with 2 tablespoons of almond milk. Place the remaining brownie batter on top in 4 dollops then use a knife to swirl the batter into the cheesecake. Transfer to the oven and bake for 20-25 minutes until set. Let cool completely then slice. After 40 minutes it still wasn’t cooked through. Had to throw the whole thing out. So disappointed! I'm sorry to hear that Christina but this temperature and time should cook it just fine. 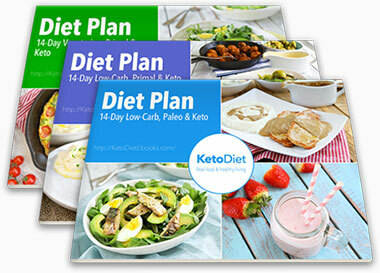 All our recipes are tested and that is one of the reasons we include step-by-step photos. I'm not sure what happened but it's not the recipe. I assume you may be living in high altitudes? At high altitudes, air pressure is lower, so foods take longer to bake. Temperatures and/or bake times may need to be increased. If it wasn't set you didn't have to throw it away, you could have just baked it for a little longer. Also, keep in mind that the cheesecake layer will seem a little wobbly until it is completely cooled and chilled. These are pretty good. My brownie batter was too thick to swirl. I used less sweetener than called for mostly because too much erythritol busts my belly. I think they need some brightening, like a touch of lemon juice and probably some raspberry flavoring. Also, frankly, I think most keto dessert bloggers make the "real" thing for photos because keto desserts never, ever look like their photos. 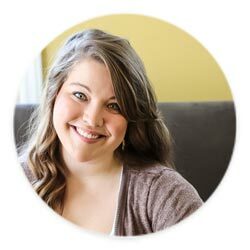 I speak from trying different recipes from different bloggers for almost 2 years now. All in all, a decent cheesecake brownie. Thank you Julie, I always use sweetener to taste - this would be too sweet for me too so I'd personally halve the sweetener. When it comes to photos, I don't know about others but I NEVER EVER used the "real" thing for photos. That would be totally unprofessional and just wasted food. Having said that I did see many photos like that on Pinterest (e.g. when you see a fluffy white bagel you know there is no way it's low-carb). It really bothers me because it creates the wrong impression and false expectations. And it seems that this also make us who never fake it look bad. - spray oil on food to make it look juicier, especially when food takes too long to photograph and it dries out. - adding some freshly cut veggies in a cooked meal just to keep the colours happy (overcooking or even just cooking may make them look dull). - photo editing (adjusting brightness, sharpness, saturation, etc). I personally keep my photos as natural as possible. - placing a piece of cloth in boiling water and then placing it behind a plate to make it look steamy. What cream cheese would you recommend for this recipie? Hi Maggie, you can use Philadelphia that is widely available. It’s says a stick of butter but than says 4oz. Which is half a stick. Which is it? Right now I only have 4oz. in but it’s so thick I can barely stir it. Thinking I’m going to add another 4oz. and see what happens. Thank you Mel, I'm glad you enjoyed!